The procedure for radio wave therapy is comparable to that of laser therapy, as, here too, a flexible catheter is inserted in the affected saphenous vein and the vein is obliterated by heating. The vein then dies off and is subsequently broken down by the body. As with laser treatment, patients with statutory health insurance must pay for radio wave therapy themselves in Germany, because the statutory health insurers usually only reimburse the costs of classical vein stripping. Who is radio wave therapy suitable for? In all cases of radio wave therapy, the saphenous vein can only be removed by laser therapy if the deep venous system is healthy. This is checked before treatment, for example, by an ultrasound examination (Doppler ultrasonography). In contrast to vein stripping, radio wave therapy leaves no lasting scars, so the procedure is most suitable for patients who attach great importance to the cosmetic outcome. Furthermore, in contrast to laser therapy, radio wave therapy usually causes fewer superficial bruises. For local anaesthesia and to protect the surrounding tissues, a special anaesthetic is injected into the fatty tissues under the skin around the affected vein. A hollow needle is inserted in the affected saphenous vein above the knee or at the ankle. The radio frequency catheter is inserted in the affected vein segment. The vein is heated from the inside and obliterated. 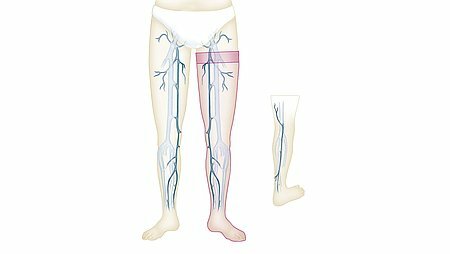 Venous insufficiency itself cannot be cured by surgery for varicose veins. Therefore, patients should continue to wear their compression garments every day after successful vein surgery to prevent the onset of new varicose veins and enjoy the outcome of the operation for years to come.